An evening to be remembered, many years to come, for so many wonderful reasons. Mayor Ted Wheeler welcomed Suzhou Foreign Affairs Director Xu Huadong to Portland for which PSSCA President Lynne McIntyre and Elizabeth Edwards, Interim Director, Office of Government Relations at City of Portland participated in the gift exchange. 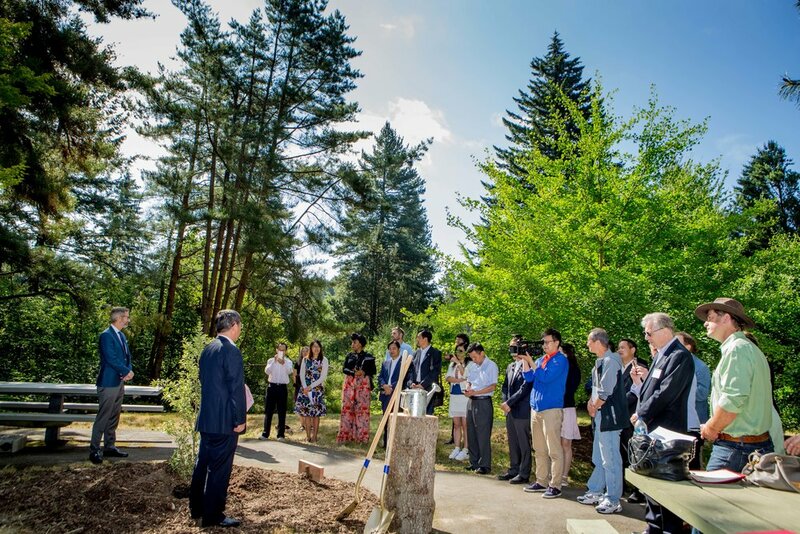 There was the heartfelt speech by Portland Mayor Ted Wheeler extolling the friendship and important meaning of the Portland Sister City relationship with Suzhou. That incredible friendship was confirmed when the Mayor bestowed upon PSSCA’s Foreign Affairs Officer, Lu Hehe as an Honorary Citizen of Portland. Known to her friends here in Portland as Dorathy, she was honored for her 13 years of dedicated service to PSSCA. Former Mayor Bud Clark, one of the founding fathers of PSSCA, joined Bonnie Starkey, PSSCA Secretary in the ceremony. The Mayor congratulated Julie Richman, Principal of the Hope Chinese Charter School for the PSSCA Cultural Leadership Award for the school’s award-winning participation in the Jiangsu Province International Youth Art Competition. Director Zhang Jian accepted the PSSCA Educational Leadership Award on behalf of the Confucius Institute, celebrating their 10th Anniversary at Portland State University. Mr. Lu Chen, Senior Logistics Director, GC for Nike Logistic Center in Suzhou accepted the PSSCA Business Leadership Award. 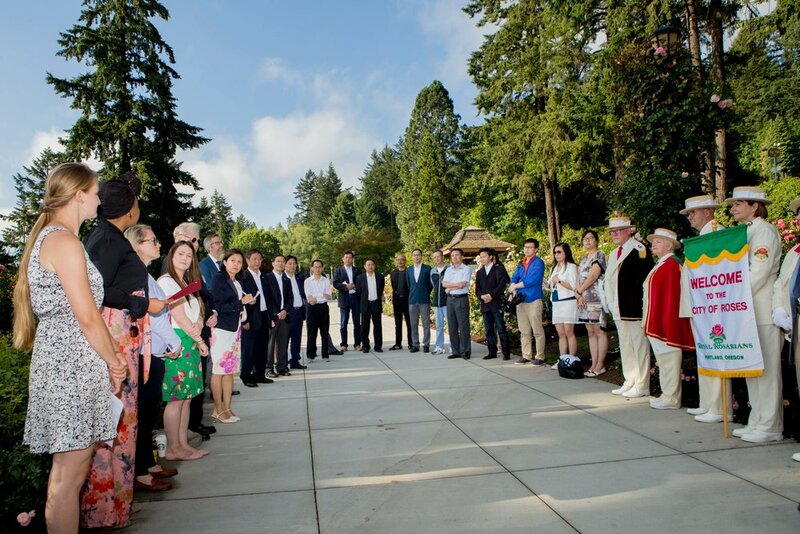 Rachel Burlington, Curator of the Portland's International Rose Test Garden was honoured for her cooperation with PSSCA in establishing a Portland Suzhou dedicated Rose Bed that will be on display at the Garden. Once again Andre and Ardina Wang honored a PSU Scholarship Award to Yamin Hong who is in pursuing a degree in accounting. This special evening will also be foremost remembered for PSSCA President Lynne McIntyre’s wonderful stewardship of emceeing PSSCA’s Evening Under the Stars Gala for the very last time. She recently announced to the Board of PSSCA that she will be relocating to Los Angeles to join her daughter. She has been President of PSSCA on two different occasions and has been a member of the Board since 1998. She will be dearly missed. We wish her the very best and thank her for her long and dedicated service to PSSCA. PSSCA wishes to thank the following sponsors for helping make this fundraising evening a most successful one: Platinum Sponsor, The Lan Su Chinese Garden and Polytech Heating LLC, Griffin Mesher & Davis Wright Tremaine, LLP; Gold Sponsor, The Confucius Institute and Berkshire Hathaway Home Services; Bronze Sponsorship, donor-bridge, Mark Spencer hotel and the Oregon - China Sister State Relations Council.